A Message from Cynthia- This actually happened to me: I looked in the mirror and discovered a droopy left eyelid that was pooling onto my eyelash. No wonder my eye makeup didn't wear right. The Facial Magic exercise program re positioned my eyebrows and tightened my eyelids. Do you see the tell-tale signs that your eyelids are changing? Drooping eyebrows and eyelids can make your entire face look tired, even lop-sided. Our easy-to- follow program will teach you step-by-step proven exercises that will transform your upper eyes and forehead, cheeks, pouches, jowls, even the dreaded wattle and more. These proven facial exercises will lift, tone and tighten your face naturally! You will look years younger. Real Client, Photos are 3 weeks apart. Relax your eyebrow area and then place the three middle fingers of each hand directly under your eyebrows. Drop the palms of your hands flat against your face. With the pads of your fingertips directly under your eyebrows, push your eyebrows upwards and slightly outwards. Hold your eyebrows in this position with your eyes open. Slowly push your eyebrows down against your fingertips while holding your eyebrows high, and hold the contraction for 5 seconds. Remove your hands from your face. Breathe in deeply through your nose, and exhale through your nose. Repeat the exercise. This time hold the contraction for 10 seconds. At the seventh second, close your eyes, keeping your eyebrows held high. Remove your hands from your face. Breathe in deeply through your nose, and exhale through your nose. Begin again, holding the contraction for 10 seconds and closing your eyes at the seventh second. Repeat the movement again so that you have exercised for a total of 35 seconds. After you give yourself an eye lift, think about the rest of your face. Why not firm and lift your cheeks, jowls and neck? Your results will become evident each day and more so over the next few weeks. Your face will look revitalized and you will have increased confidence knowing that you look refreshed and youthful! Remember, when you use Facial Magic, it shows! 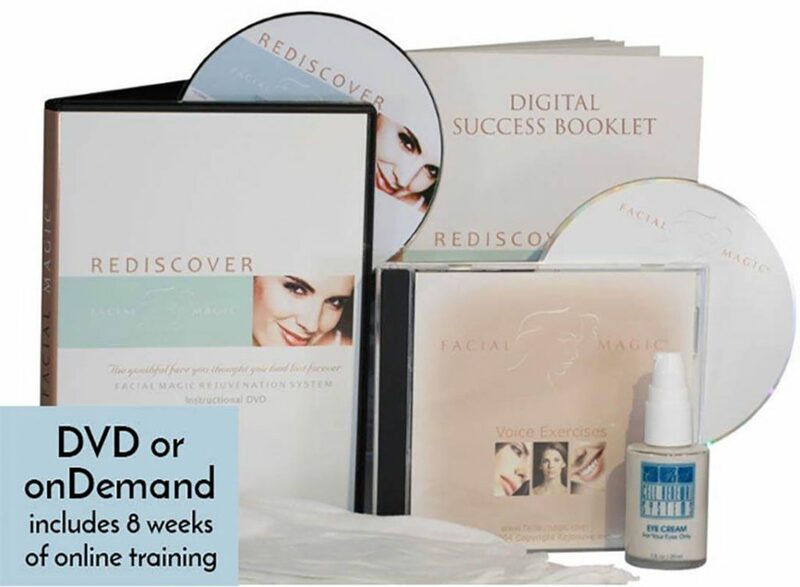 Our starter kit contains 18 easy-to-follow face firming exercises on DVD (in Spanish & English), Eye Cream, 6 pair exercise gloves, the Voice CD and your digital Facial Magic Success Booklet that has your progress chart, a place for your beginning photo, exercise tips, skin care tips and more - all for less than the cost of a facial! NEW! OnDemand streaming available now on any internet connected device. Order today and see visible lifting in just days. You will love your results! PROMISE!!! Free Shipping US!